Summary: Four kids from a robotics team are traveling to a competition in Japan. Disaster strikes, and the plane crashes, most of the passengers ripped through the ceiling before impact. There are eight survivors: the robotics team, plus four other kids. Before crashing, each of the survivors experienced a jolt that felt like a mind probe. Although the plane was flying over the Arctic Circle, it has landed in the middle of a tropical jungle. 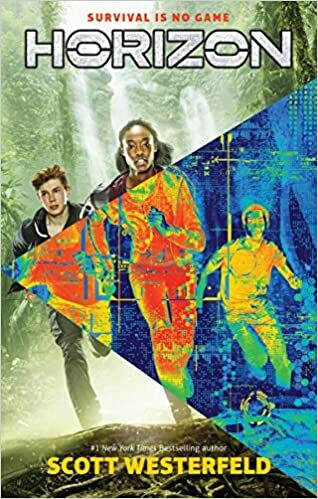 Before long, the teens discover dangerous birds and vines, as well as a mysterious device that allows them to adjust gravity. There is one adventure after another as they struggle to stay alive in the jungle and try to figure out where they are. Could it be another planet? The cliff-hanging ending assures a sequel, most likely more than one. 256 pages; grades 4-7. Pros: Strong, intelligent characters and a fast-moving, action-driven plot will make this a popular choice for many readers. Cons: Given the premise, I didn’t find this to have the page-turning excitement as I was expecting.